National Australia Bank has pledged to not close any branches in drought-declared areas of the country, the first policy change made by any of the majors since the devastating royal commission interim report which flagged the urgent need for action to restore community trust. Mike Baird, NAB’s new chief customer officer of consumer banking, said Commissioner Kenneth Hayne’s 1000 page report made for “very sobering” reading, and the banks would now be judged “not by words but by actions”. “We have to own the mistakes we have made and respond to them – and we will,” he said from Hobart during a trip to meet customers. NAB has around 350 rural branches and around 150 of these are in areas declared by state governments as in areas suffering drought. NAB said on Tuesday none of these branches would be closed while the drought persists. The decision to keep them all open comes after NAB backflipped on a decision to close its Dungog branch in regional NSW, which came shortly after a visit from NSW Labor leader Luke Foley who called for a moratorium on all bank closures in drought-affected areas. NAB has decided in July to stop charging penalty interest to drought-ravaged farmers, after the royal commission exposed the practice. The same month it also said that customers in regional Australia could offset their ‘farm management deposits’ against lending to discount to their interest rate. 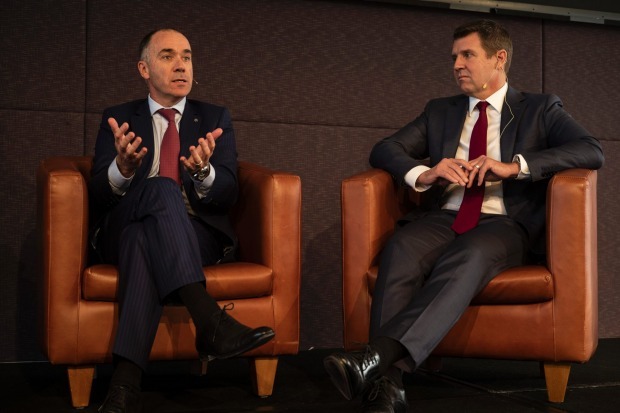 NAB CEO Andrew Thorburn and Mr Baird at a recent ABCC lunch in Melbourne. NAB also broke ranks with the other banks last month, announcing it would hold its standard variable interest rate on mortgages flat despite rising funding costs and upward moves by its rivals, which it explained by seeking to reward loyal customers. “Those announcements, and this one today, is tangible evidence we are not just talking but we are walking the walk,” Mr Baird said in the first interview given by a senior banker since the interim report was released. As bank shareholders monitor cost pressures across the sector given the revenue pressures, Mr Baird pushed back on a suggestion the bank was shifting the costs of keeping branches with low foot traffic open at a time when most transaction banking is shifting on line. “The more we look after customers the more they are going to look after shareholders in the longer term,” he said. NAB has spend the past three months examining its rural footprint and Mr Baird said that while it would not close branches when an area is in drought, it was inevitable that some branches would have to close outside drought areas but the bank had learnt this needed to be done sensitively. “There is a capacity to provide extended periods of consultation and more one-on-one engagement, especially with the elderly community, to show them how online banking is evolving and can suit them,” he said. He also suggested there are more changes to come at NAB is it tries to restore its reputation after the royal commission pummelling.